"Doube Bill" is what it is called, two films back to back, stretching to the wee hours of the night. Where, at the end, you can think about the film, fidgeting with it, rolling in inside you head, while you puff out the insanely mesmesmerising WILLS NAVYCUT cigarrete into the cool misty air of my hometown on top of our newly built mansion, I prefer to call it a mansion, in view of my present studio apartment in non-hip Qusais, Dubai. Well, two films, both connected either by the genre they belong to or share the same lead actor or may be the same bigshot director. I remember "True Lies" followed by "Toal Recall" and how can i forget Robbin Willians special "Jumanji" and "Mrs. Doubtfire". So, while I got yet another film from my college library and one from my DVD parlour in Qusais. One day, out of pure curiosity, I asked my seemingly ignorant DVD parlor guy, if he is a member of Cannes Film Club, I gave me first a good hard look and said "Kann! !Wo kya hota hai", I said nothing and picked up City by the Sea this time. I promised I won't act so hurridly like this ever, probably he can also hardly explain the phenomenon, the fact of the matter remains, how on the earth does foreign titles like "Ebrahim Monsier and the flowers of Quran" or take for instance "The wind that shakes the barley" find themselves in English film shelf. And I knew it for sure, so did he, that this would be first and last time, someone had showed interesting on those film, the entry card was blank except for my name - shabbir. "God!! they misspel my name every time"
So, much for a double bill, well, time I really cant smell the misty cool air, but a hot wind blowing to my face, whispering nothing in arabic. 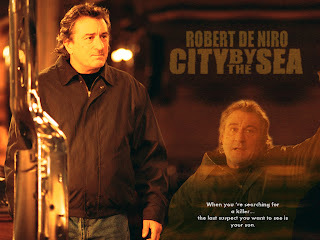 This time the "double bill" is The Departed (2006) and City by the Sea (2002). Plot Summary: New York City homicide detective Vincent LaMarca has forged a long and distinguished career in law enforcement, making a name for himself as a man intensely committed to his work. But on his latest case, the stakes are higher for Vincent--the suspect he's investigating is his own son. He and Joey have been painfully estranged ever since Vincent divorced his wife and left the decaying boardwalks of Long Beach, Long Island for the anonymity of Manhattan and a successful career with the NYPD. He lives his life in solitude, keeping his girlfriend at arm's length; But this murder investigation is drawing Vincent home to Long Beach, the self-proclaimed City by the Sea, where the past has been waiting for him to return. The agonizing memory that has tortured him all his life--the death of his father, a convicted murderer who was executed when Vincent was just a boy--still plagues him. Review:Before I started the DVD of City by the Sea, just wanted to gauge the mood of the film, so I went about to see the trailer of the film. It sometimes fun to locate the high points in the film after watching the trailer, if you remember when digital technology and effects hooked on the trailer making industry and every other film out of the stable looked like some Fantastic Four films or every film looked like a gangster thriller Godzilla movie, great gun-fights, chase sequence or Drugged overdosed movie like "Requiem for a Dream"
City the Sea, is nothing what the trailer looks like, may be, no one bothered to check on the Director's filmography before setting out to make the trailer. But we are not here to talk about the trailer, but the film, so here we go. Robert De Niro, a police detective who have gained an extra 5 Kg, its a stormy night, and his girlfriend living on the 3rd floor, he lives on the 4th, is a little scared and needs his company, she need him. He has just came from his office, had a beer, made dinner for himself and yes, walking down the stairs to give company to his girlfriend and 40 yr old spinster. A great chemistry seems to be building up between them and you start wondering if the story is about them. But leave the details, she is just an anchor to the great emotional disengagement Robert De Niro shares with his estranged boy played by James Franco. This film is not about drugs let me tell you that, not about two old people trying to connect to each other, and nor about two police man sharing a great working relationship, this is just the opposite to the film "Road to Perdition". A man not willing to sacrifice his embittered past to face his future and fight for his son. When Robert De Niro confesses his story to his girlfriend whom he has kept in dark, he tells her "That was an old me, and I didn't wanted you to know it". His son in his last days of a convict, tell his father, "Ya, I killed the man, but it was the good me, not the real me". You see the connection, City by the Sea, is a great emotional story whose sloppy pace will at no point act as a hindrance towards its possibly tragic ending. The drug dealers but looks like some paper tigers and don't really scare you, infact, it disappoints you a bit. 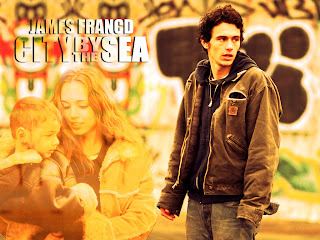 James Franco gives a great performance, I really like what he does, when he is not talking, and same goes for Robert De Niro, his controlled performance will what reinforces the fact that he has always something different in store for you. I like the whole decaying feel of the film, and the over emphasis on the emotional strain both the father son goes through in the film. A highly emotional drama which will leave you high and dry throughout the film. It doesn't try to stylize or waste any efforts in glamorizing the setting of the film, hardly any efforts seem to go in that direction. Had any other director goes this script, could possibly make a stylized drug infested neighborhood, but what remains out of Michael Caton-Jonen's film, is the drama, so well told and so cleanly depicted. Yet, no thrills, no frills, just a tearful fatalistic film of a man, turning his back to the past and feeling sorry for his lost chances.